A wise man has said time is the most valuable and once you will have a look at these most expensive watches in the world you will be forced to believe that time is really valuable. If you are amongst those few people who love to dress up and are filthy rich and are prim and proper you would not mind investing in a luxury watch. The most luxurious watchmakers were asked about their most costly product on the market today and the results were jaw-dropping. 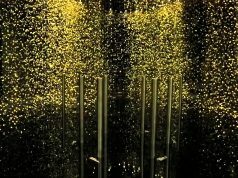 The price ranges between $75,000 to $25 million for the most expensive one. The most expensive watches in the world make us think the time is really very valuable. In the 19th century Baume family’s watchmaking business became one of Switzerland’s major watch manufacturers with branches in London, Geneva and Philadelphia. Further collaboration with Paul Mercier ensured the quick success of the business. William Baume Tourbillon features black dial, black alligator strap, 52-hour power reserve and its unique “flying tourbillon”, which is held in place on only one side rather than on the top and bottom. Another distinctive feature of this watch lies in the unusual and elegant 9 o’clock position of its escapements and a small second display at 6 o’clock. The William Baume Flying Tourbillon is a very beautiful watch with its 43mm 18k rose gold case and sapphire crystal and back case that reveals a beautifully decorated movement. 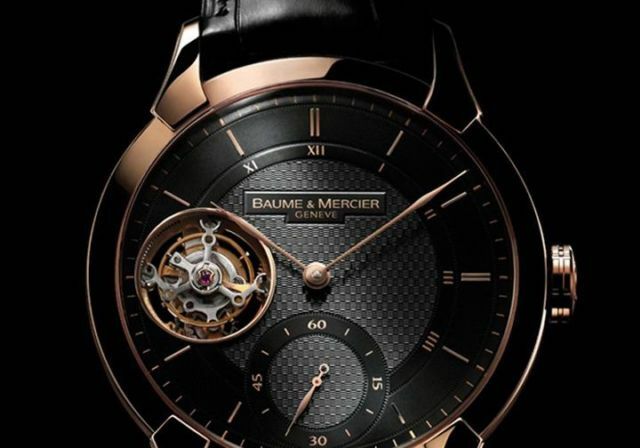 Today Baume & Mercier is an established name in the world of luxury watches with its aesthetically pleasing and most technologically accomplished interpretation, the flying tourbillon. The most important TAG Heuer watch ever produced – The Monaco V4 in platinum – one of 150 pieces. Taking six years of further development (including work from the legendary Jean Phillipe Dufour) from the presentation of the original prototype, the innovative and technically challenging automatic ‘V’ calibre is truly ground-breaking. The V4 is designed around the engine of a high performance sports car, using materials, techniques and ideas never before seen or implemented in watchmaking. The traditional wheel and pivot based going train has been replaced by a series of high tensile belts, breathing a uniquely industrial spirit into the watch, it was this belt system that proved the toughest technical hurdle to clear. 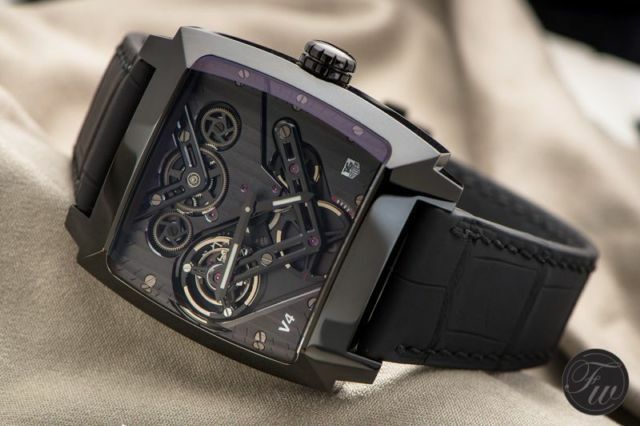 The automotive DNA runs through to the rear of the movement which is also where this Monaco gets its name, the four barrels are laid out to match the configuation of a four cyinder engine, whilst the unique ‘vertical slide rotor’ utilises a solid ingot of ultra-dense Tungsten. A unique piece of horological history, this watch will certainly stand out in any serious watch collection, presented with original V4 polished wooden box, instructions, certificate and two year warranty.